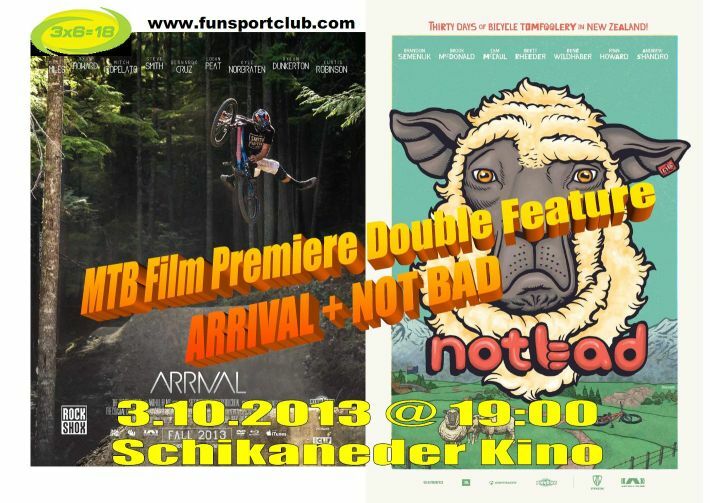 Am 3.10.2013 zeigen wir im Schikaneder Kino die Österreich Premieren von NOT BAD (der neue Film von Anthill Films, die uns schon Follow Me und Strength in Numbers gebracht haben!) und ARRIVAL (das zweite Werk von Secondbase Films, den Machern von From the Inside Out). This is a tale of epic adventure. A tale of seven brave riders who set out from the four corners of the globe to gather together under one roof in a town located at the ends of the earth. A tale with no beginning and no end but where a few things happen inbetween. Things like eel fights. Yeah that’s right…f’n eel fights. So watch this movie. Why? Because its ‘Not Bad…30 days of bicycle tomfoolery in New Zealand’. A new short film from the crew who brought you The Collective, Roam, Seasons, Follow Me and Strength In Numbers. Starring: Brandon Semenuk, Brook McDonald, Brett Rheeder, Cam McCaul, Andrew Shandro, René Wildhaber and Ryan Howard. Step into our world, as we bring you a raw look at the talents of the next wave of riders and photographers. Come face to face with our diverse styles as we take on new lines and new places. “Arrival” is all about what is happening now. Building on the worldwide success of their 2011 release "From the Inside Out", Secondbase Films is proud to bring you a new mountain cycling actu-mentary “Arrival”. Produced by Anthill Films and directed by the Coastal Crew, “Arrival” brings viewers into the reality of a new generation of freeriders and racers.